After 51 World Series of Poker cashes, Scott Bohlman finally found gold on lucky No. 52. Bohlman, a regular face at the Rio All-Suite Hotel & Casino for over a decade — his first cash dates to 2005 and he grinds all of the games — topped a field of 205 players to win $122,138 in Event #40: $2,500 Mixed Big Bet. The Chicago-area native had made six unofficial final tables at the WSOP but never quite closed the deal, much to his chagrin and the amusement of a few friends who admitted they threw the occasional needles his way. Event #40 here looked to be his most golden opportunity yet. He said he held the chip lead for a large portion of Day 1 but felt a bit snubbed that he wasn't recognized as such for a portion of the day by the hardworking reporters from PokerNews. He conceded the spotlight to more famous faces like multiple-time bracelet winners John Hennigan and Jeff Lisandro. "That's kind of the history of the last 15 years," Bohlman said. 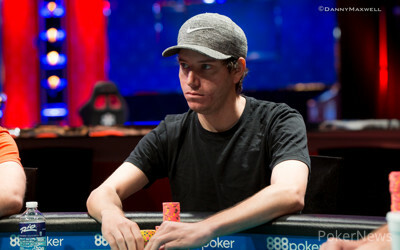 On Day 2, players and media alike had to take notice of Bohlman's dominance as he bagged a startlingly massive chip lead. Although he had a big stack for much of the day, he really turned things up with two tables left, busting big stack rival Dario Sammartino when the Italian made the third nuts and Bohlman a wheel in pot-limit 2-7 triple draw. He also dusted Shiva Dudani and Warwick Mirzikinian, both of whom had solid stacks, in the same game, which definitely provided the biggest action in the seven-game mix. Bohlman finished out Day 2 with 60 percent of the chips in play with four opponents remaining. Just five players advanced to the final day. Though experienced, accomplished foes like WPT champ Daniel Weinman and two-time bracelet winner Ryan Hughes remained, it was clearly Bohlman's bracelet to lose. He knew this had to be his time and wasn't going to accept anything less than victory. "Win it," he said of his mindset heading into the final day. "That's it. There's no other option." However, what looked like it could be a fast final day instead had the potential to go long after Bohlman handed out a number of doubles and wound up three-handed against Hughes and Weinman with everyone relatively close in counts and stacking 50-plus big blinds. Hughes may have even taken the lead momentarily. Given Bohlman's long history of cashes without a win and his past close calls, it would have been easy to understand some frustration. However, if he felt any, he didn't show it. He continued laughing and joking with his tablemates in between hands. "It was on to the next," he said of letting his monster lead slip. "On to plan B. Plan A was to just put it in their face and plan B was to go to more ICM small-ball three-handed with more level stacks." They took a break and Bohlman immediately regained his big lead in triple draw against Hughes, making a seven-six and getting paid for 300,000 on the end to get back to 1.3 million out of 2.6 million, almost where he started the day. He finished Weinman with trips against kings up in five-card draw and then rolled a 5-1 chip lead into a win against Hughes after getting stacks in with a set against top pair and a low draw in Big O on the turn. Bohlman and Hughes battled for the bracelet. 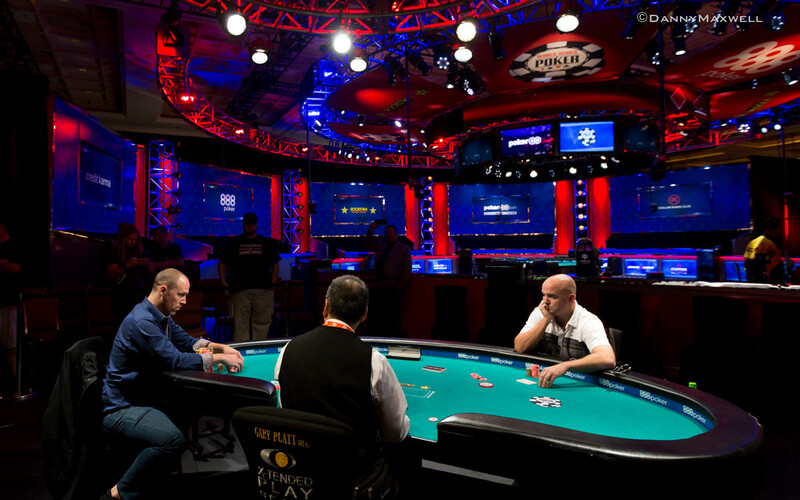 Regular observers at the WSOP may be used to seeing Bohlman play most of the limit events, but he felt right at home in the Mixed Big Bet. He's got a number of high finishes in pot-limit Omaha events and said he'll happily play "any mixed game." He said he enjoyed this format, only in its second year at the WSOP. "I didn't get to play it last year so I didn't realize how fun it was," he said. "I think the average and having antes in every game made it really fun and interesting." "It was more fun with a deeper stack. Shallow stacks would be more punished by the antes. Overall, it was a very fun tournament." Bohlman admitted he felt not only happiness but relief with the win. He'll be recognized as a bracelet winner from here on for as long as he keeps showing up and grinding out a packed WSOP schedule — which he says he still plans on doing. However, there's one group of people he's still going to take some grief from: his Chicago-area poker-playing buddies. They've needled him over the years about his lack of bracelet wins despite putting in high volume, and even in victory, he endured some ribbing from his rail. "It's not gonna stop them from needling me," Bohlman said with a smile. "That's what friends are for." With on the board, Scott Bohlman checked and called 80,000 from Ryan Hughes. On the river, Bohlman came out betting with 200,000 and Hughes muttered something to himself, shook his head and folded. Two hands later, they saw an flop for the minimum. Bohlman bet 25,000 and Hughes called. On the turn, Bohlman checked and Hughes potted for 86,000. Bohlman jammed for about 200,000 more and Hughes called. Bohlman had the best of it with a set and was looking to fade low cards. The river was exactly what he was looking for, ending the match in his favor. 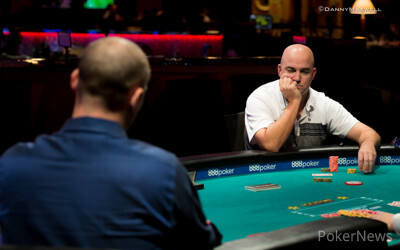 The final table lasted an extra day with both Eric Baldwin and Ian Steinman returning for heads up play. 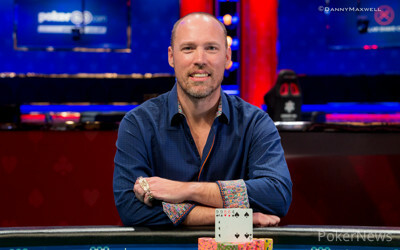 Baldwin was able to keep his massive chip lead during heads up play and finally knock out Steinman for the $319,580 first place prize. He tells Sasha Salinger of PokerNews that today is his wife, Mary's, birthday and now they have an extra reason to celebrate! Ryan Hughes bet 20,000 from the button on and Scott Bohlman raised to 75,000. Hughes called. Bohlman potted the turn for 186,000 and Hughes folded in short order. Ryan Hughes raised to 35,000 and Scott Bohlman called. They drew one apiece and Bohlman led out 50,000. Hughes, however, fired a 200,000-raise and Bohlman let his hand go. Daniel Weinman opened for 35,000 on the button and Scott Bohlman made it 150,000 in the big blind. Weinman jammed for about 500,000 and Bohlman quickly called and pitched two. Weinman shook his head and threw away one and sure enough, Bohlman showed . Weinman had a shot with after Bohlman didn't improve but the he got didn't fill him up and he exited in third. Virtually tied in chips, Daniel Weinman and Ryan Hughes were in a battle of blinds in a limped pot. Weinman led 12,000 on the , Hughes bumped it to 66,000 and the money went in. Weinman potted, Hughes shoved and Weinman called. Weinman flopped an open-ender and a low draw while Hughes hit two pair. The filled Weinman's better low and he looked to win the whole pot should he hit an ace or a six on the river. But the left the pot halved and play continued as if nothing happened.